On Sale Now! Save 4% on the Tripp Lite 16-Port AC Charging Storage Station Cabinet for Chromebooks, Laptops & Tablets, 17'' Depth, Wall Mount & Cart Options (CSC16AC) by Tripp Lite at Pacs BG. MPN: CSC16AC. Hurry! Limited time offer. Offer valid only while supplies last. The CSC16AC 16-Device AC Charging Station Cabinet provides AC charging, secure storage and cord management for up to 16 Chromebooks and laptops. The CSC16AC 16-Device AC Charging Station Cabinet provides AC charging, secure storage and cord management for up to 16 Chromebooks and laptops. It’s ideal for education, office, commercial, retail, industrial and healthcare environments. 16 AC outlets provide convenient charging for Chromebooks and laptops with a screen size up to 17 inches. Their AC adapters plug into the cabinet’s 16 NEMA 5-15R outlets as needed, up to 1,440 total watts. The CSC16AC also charges tablets and other USB devices through their power adapters. A built-in circuit breaker protects against overloads. The 10-foot AC input cord with NEMA 5-15P plug reaches distant outlets to help you place the cart in a convenient location. 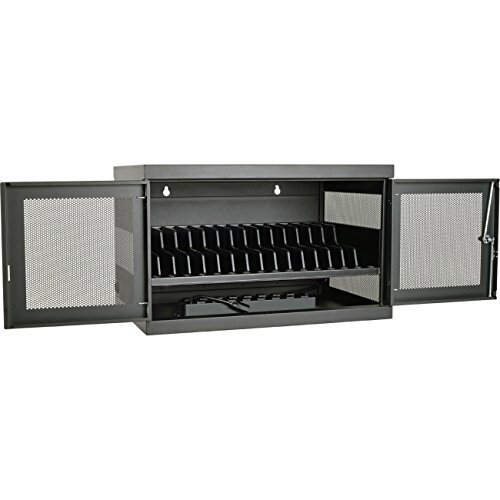 The cabinet provides comprehensive device protection with steel construction and a black powder-coated finish for long-term durability. It locks with the included keys to prevent device theft, damage or tampering, and flow-through ventilation prevents overheating. The cabinet also provides clutter-free organization of devices and cabling. AC outlets, power adapters and cords store out of sight. A toolless trim panel permits quick service access. The cabinet is easy to configure. The cabinet It ships fully assembled. and supports mounting to a wall, desk, table, counter or floor. The front doors open 180 degrees for unrestricted device and service access. Rear-panel slots support optional wall-mount installation, and removable dividers accommodate thicker devices. You can also convert it the cabinet to a mobile cart with Tripp Lite’s optional CSHANDLEKIT2 (sold separately), and roll it where needed.